Clear and simple design - a few track elements are sufficient even for complex layouts. Realistic appearance with carefully crafted wooden sleepers. Solid non-corrosive nickel silver track with a high electric conductibility. Endless possibilities for layout expansion. 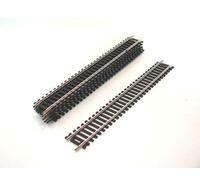 Track elements are compatible with those of all other manufacturers of H0 scale DC track systems.